We thought when the ice went out a couple of weeks ago that meant that winter was over. Then on Wednesday night we had 10 inches of snow dumped on our heads. What's up with that? On Saturday, we shoved the boys and the dogs in the back seat and drove to the farm for Easter. There's a lot of windmills in Minnesota and Iowa any more. Trains also. Miss Sheri's mom and brother were excited to see us and we were excited to see them. The dogs were excited for some farm freedom so they could run wild and eat gross stuff they found in the yards. Easter morning came and we were excited to have the chance to spend the day with Grandma Leona. We headed over to Uncle Jerry's and Aunt Laura's for an Easter Feast. We like to call it Feaster. I was excited because I didn't have to sit at the kid's table this year. We had a great time celebrating the holiday with good friends and family. Happy Easter to all!! The boys took a trip to Peoria, Illinois on Wednesday so Miss Sheri and I had a chance to go on a date. Which is nice. 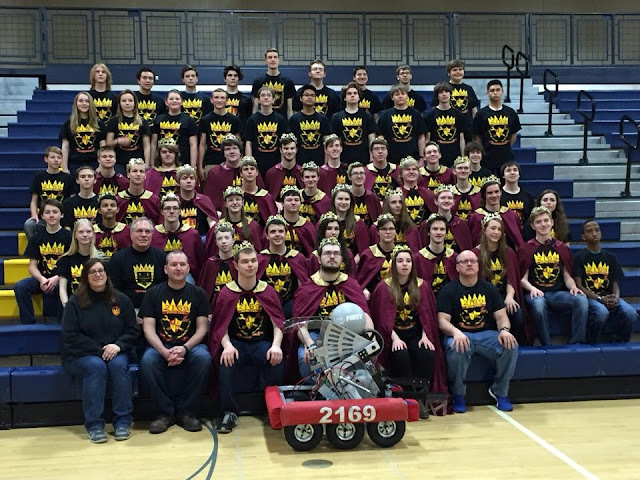 On Thursday night, we drove the 7 hours to Peoria to join them and Prior Lake High School's FRC Robotics team #2169 KING TeC. We arrived just in time to watch the chairman's committee demonstrate their presentation they would be delivering to the judges. They said they hadn't practiced together in a couple of weeks, but I'm guessing they were teasing about that because their performance to us was flawless! Friday morning, we met up with our good friend, Nancy Wangness, who was one of the chaperons for the event. We drove to Bradley University where the tournament was being held. It was a perfect arena for an event like this. There wasn't a bad seat in the place. The field was on the arena floor and could be seen from anywhere in the building. This was our first chance to see this year's robot in action. They went with a brand new drive train system this year which gave their robot a lot of power. Once they figured out the correct way to program it, the robot became a crowd pleaser because it's powerful acceleration sent it flying over the ramps much like the Dukes of Hazards car! KING TeC became known throughout the tournament as having the "Robot That Flies!" This year, Avery was on the programming team while Luke helped out with the chairman's committee. They also really like wearing crowns and capes. This was Mike Lins first tournament as head coach of the team. He did a good jump at pumping everyone up to perform at their best. We had a great time hanging out with the other parents although it was a bit embarrassing to discover that somehow we all ended up wearing the same shirts. The team has a whole bunch of phenomenal role models with a bunch of hard working coaches, mentors, chaperons and parents. The team is full of great kids also who each hold different roles in the organization from building, designing, programming, and driving the robot to supporting the team in the stands with scouting and cheering to a wide variety of outreach events the team does throughout the year to promote STEM and spreading the message and ideals of FIRST Robotics. It's an incredible program. Luke and Avery have been in robotics with Jackson since they started back in 7th grade. They still have bunches of fun together. Peoria was host to 40 different teams from 7 different states. The pits are full of frenzied activity throughout the weekend as each team prepares for their matches. Robotics is a great family activity and we highly recommend it! The team had a solid performance at this tournament. They ended up ranked 12th after the qualifying rounds and were selected to participate in the finals by the 7th seeded team. They ended up being eliminated in the first round by the second seeded team 2 matches to 1. That's definitely worth a selfie. The team was also bestowed with the 2016 Entrepreneurship award for having the most impressive business plan showcasing the team's outreach and action plan. We're real proud of all the kids! Here's the highlight video of Prior Lake High School FRC Robotics team KING TeC #2169 at the Peoria, Illinois Regional Robotics Tournament.